Enter now to win Canon's full-frame mirrorless camera bundle. 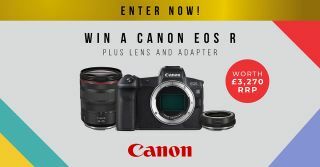 The Photography Show is running a fantastic competition to win a Canon EOS R full-frame mirrorless camera, along with the RF 24-105mm f/4L IS USM lens and the Mount Adapter EF-EOS R, worth £3,270. The Canon EOS R packs impressive specs, including a 30.3MP full-frame CMOS sensor, a staggering 5,655 Dual Pixel AF positions, fully articulating touchscreen and 4K video capability. The Canon RF 24-105mm f/4L IS USM is a fantastic lens that pairs perfectly with the EOS R, offering a versatile zoom range, great sharpness, image stabilisation and L-series build quality. And, with the Mount Adapter EF-EOS R, existing Canon EF and EF-S lenses can be used seamlessly, giving the EOS R a formidable range of optic options. The Photography Show – the UK's biggest and best event for photographers and videographers – runs from 16-19 March 2019 at the Birmingham NEC, with star professionals such as Martin Parr headlining the Super Stage. Tickets for the show are available now.